It's been awhile. I've been busy moving from Greenpoint Brooklyn to Jersey City, NJ. The move is now nearing completion and beer blogging will start to pick up again. For now, if you haven't seen them already, please watch Stone Skips Across the Pond. Its a well produced series of videos documenting the guys from Stone traveling to Norway to brew with Nøgne Ø then moving on to Scotland to brew with BrewDog. 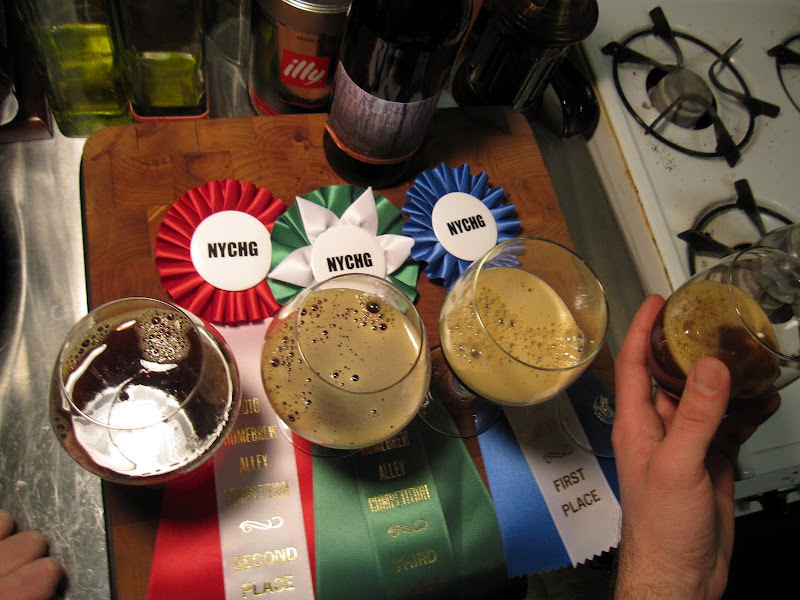 This past Sunday was the NYC Homebrewers Guild "Homebrew Alley 4", their fourth annual homebrewing competition. As I stated in the previous post, we entered 5 of our beers. In our testing of the beers the night before dropping them off for entry, we determined that our Number 2 English Barleywine and our Smoke Ale were our best attempts, and we hoped we would maybe place with one of them. Well, I'll be! Above: (from L to R) Tim Bullock, Jeff Quinn and myself, John Kleinchester. Award-winning homebrew team! We were honored to receive First Place for our "Smokey Smoke" in the Smoke Ale category. 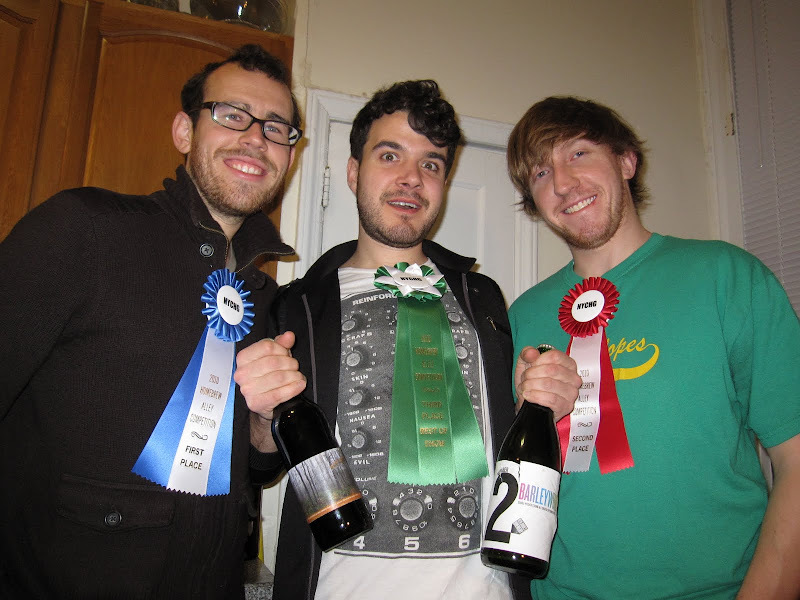 We also took home Second Place for our "Number 2" English Barleywine in the Strong Ale category. At that point we were already more than happy with the results. But that wasn't enough! 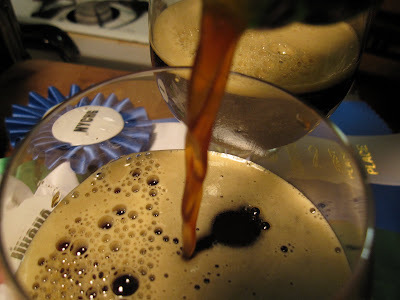 At the end of the ceremony, competition organizer Vlad Kowalyk announced that our Smoke Ale actually won Third Place Best of Show (out of 370 entries)! This was the crowning achievement. Not only did we get to take home those awesome ribbons, but we also got PRIZES too. For the first two awards we got to select prizes from a table of wonderful choices from various charitable beer-related donations. In the end we took home a 50lb bag of grain (to make more homebrew of course) and a bottle of StarSan (a homebrew equipment cleaner, not cheap). Before leaving we were able to get some score sheets for all of our entries, so hopefully for the ones that didn't do as well, we may be able to pinpoint where we went wrong and improve the recipes for the next time around. We split a cab back to Brooklyn (its hard to bring a 50lb bag of grain from Chelsea to Williamsburg) and celebrated our surprising victories with the very beers that got us there. We also were delighted to learn that our Third Place Best of Show win actually garnered us an additional prize... a $50 Gift Card to Brooklyn Brew Shop. A timely prize as we're going to be expanding our homebrewing to 3 separate micro-nano-breweries instead of just two. All in all, it was a great night and we're really glad we decided to enter. Thanks to the NYC Homebrewers Guild and all the BJCP judges AND thanks to those who came out to show their support for the Ten Dudes Brew Team: Heather, Cinzia, Jared, Pat, Charlie, Gille, Amy and Mike. 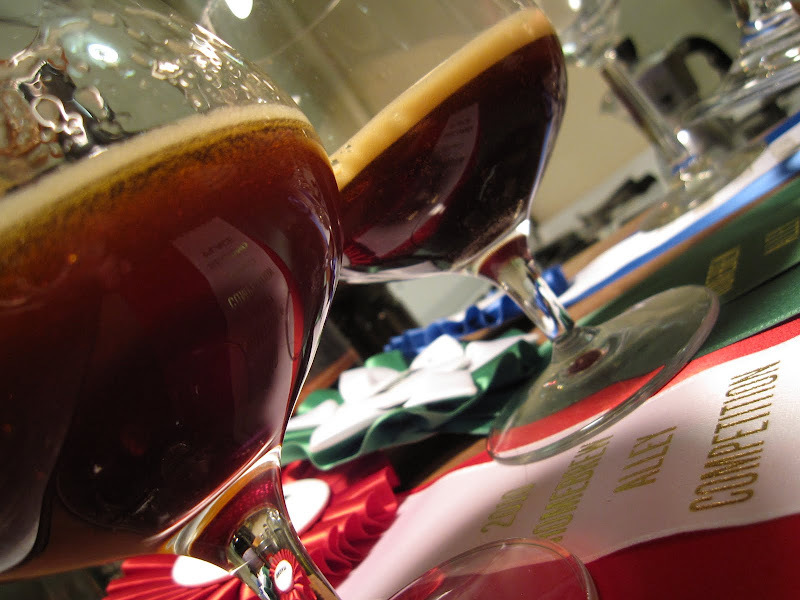 For a complete list of winners, check out the Homebrew Alley website.